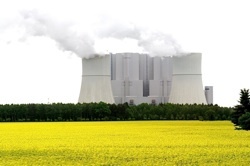 Schwarze Pumpe: Carbon Capture and Storage, Will it Lead to Clean Coal? 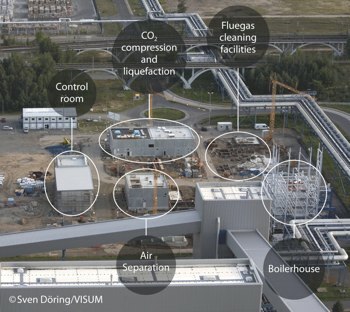 Schwarze Pumpe Part 1: First Operational CCS Plant Captures Carbon, Will it Lead to “Clean Coal”? Rising up from the eastern German countryside at Spremberg near the Polish border, the two cone-shaped stacks stand as towering white monoliths jutting into the steel-grey sky. Next to the large 1600 megawatt lignite coal-fired plant at Schwarze Pumpe stands a relatively small addition of tanks, towers, and pipes that comprise a 30 megawatt coal-fired boiler able to capture and ready to store its carbon emissions using Carbon Capture and Storage (CCS) technology. The purpose of the 30MW Schwarze Pumpe plant is to demonstrate the technology. As a test facility it does not contribute power to the grid. 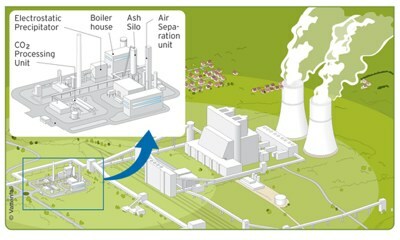 Vattenfall sells the steam generated that would otherwise turn a power-generating turbine to a neighboring paper mill. Schwarze Pumpe was built and is operated by Vattenfall, a Swedish based power utility and one of the largest operating throughout Northern Europe. After completing an initial test CCS test project in 2001 Vattenfall began development of the Schwarze Pumpe pilot plant in 2004. Construction began in 2007 and the CCS plant started operation in September of 2008. As of last week when we visited the plant, Schwarze Pumpe had captured approximately 1000 tons of CO2 (more on the crucial storage part of the equation in part 2) through the process of Oxyfuel (pdf). Vattenfall says they are still conducting research into the pre and post combustion methods of CCS, but they are betting most of their resources on Oxyfuel as the method of choice. The Schwarze Pumpe facility was built with a €70 million investment. €10 million per year for the next three years has been allocated for operation and testing. The total cost of Vattenfall’s entire CCS research project stands at €270 million. Schwarze Pumpe proves that the technology works. Over the next few years, Vattenfall engineers seek to improve plan efficiency and bring down operating costs. The key target to economic success of the Oxyfuel CCS process is operating a full-scale plant with a per-ton carbon cost just below that of a carbon trading certificate traded on the EU Carbon Trading Scheme (EUETS), or what is expected to be somewhere around 26 euros per ton of carbon. Above that target and there is little incentive for plant operators to add CCS to their existing plants. Efficiency in plant operation and energy use is a key area Vattenfall seeks to address in the coming years. 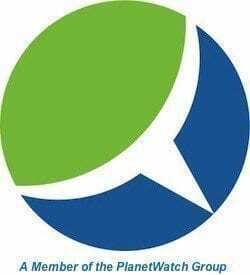 While the Oxyfyuel method is well understood with parts that are readily available, the air fractionation process and CO2 compression is energy intensive, thus reducing, requiring increased input energy from the plant to achieve. The process now operates at about 42% efficiency, with a target efficiency at 50-55%. And what about the storage? In the next post on the Schwarze Pumpe project, we’ll look at the issue of carbon storage and sequestration, the thornier of the two challenges with CCS technology.